The table below details my March quarter unit sales and revenue estimates by product line. In the year-over-year revenue comparisons, I have consolidated iPod revenue with revenue from software and peripherals. Revenue from iPod unit sales will have only a marginal impact on the quarter's results. For the quarter, I estimate 38.950 million iPhone units sold. This represents not only a strong year-over-year performance, it also represents an estimated 5.15% sequential gain over the 37.044 million units sold in the December quarter. I do expect a sequential decline in domestic iPhone unit sales. However, I expect the iPhone 4S launch on China's mainland through China Unicom and China Telecom to deliver unit sales gains greater than the sequential decline that will have been experienced in the States and other revenue regions. In the March quarter, I expect revenue generated in the Asia-Pacific region, inclusive of China, to surpass revenue generated in Europe for the first time. Apple ended the December quarter with a bit less than 6 million iPhone units in the global channel. Global channel supply is apt to have been increased from the December quarter levels. I have said many times the Apple iPad remains in a nascent phase of global market development. The new iPad, representing the third iteration of Apple's popular tablet-style product, is an undisputed success and will accelerate global adoption of this very popular product line. Currently, serious competition to the iPad does not exist and the product is rapidly supplanting traditional laptops and netbooks in both the consumer and enterprise markets. Apple's decision to keep the iPad 2 in production and available at a $100 discount to its previous price closes a window for potential competitors and positions the iPad to compete in the market for consumers interested primarily in an electronic book reader. 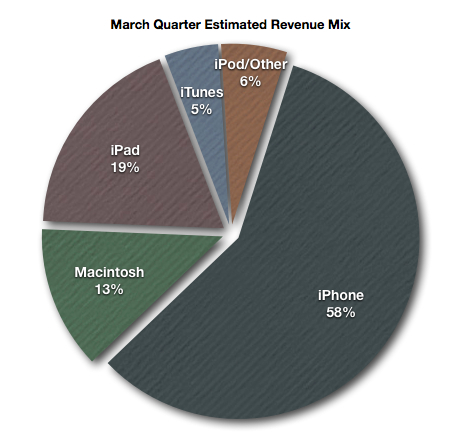 For the March quarter, I estimate iPad sales of 13.850 million units. This represents an estimated 195% gain in year-over-year unit sales but a sequential decline in unit sales of just over 10% due to seasonal sales factors. Apple ended the December quarter with fewer than 2.5 million iPad units in the global channel. Apple's decisions on global iPad channel supply may be a big factor in the number of reported units sold. I consider the Macintosh line's unit sales growth an outcome of the "Apple Product Mutual Halo Effect." In the March quarter Mac sales will have benefited slightly from the increased Apple retail store traffic that followed the release of the new iPad. However, the Mac Book Air and MacBook Pro lines are due for a major update and the seasonal drop off in personal computer sales will impact the Mac's March quarter results. For the March quarter I estimate Macintosh unit sales at 4.450 million units. This represents an expected year-over-year unit sales growth rate of 18.35% and an estimated sequential decline in unit sales of nearly 15%. For the reasons stated above, I expect revenue growth of about 78.50% based on strong unit sales of the Apple iPhone and iPad product lines. In the December quarter, Apple's gross margin reached 44.68%. I estimate for the March quarter gross margin of 44.4%. The Apple iPhone, at an estimated 58% of reported revenue, will be the biggest factor in Apple's gross margin performance in the quarter. I have left room in my gross margin estimate for changes in the iPhone model sales mix from the December quarter and a slight impact on reported revenue from currency fluctuations. In the December quarter, operating expenses consumed 7.26% of revenue. In the March quarter, I have pegged operating expenses at 7.38% of revenue due to the estimated 5% sequential drop in revenue. Apple's ability to keep the rate of growth in operating expenses well below the rate of growth in revenue has contributed to the company's impressive net income to revenue ratios. High gross margin, cost discipline and revenue rising at a frenetic rate contribute to an outstanding operating income performance estimated at 37% of reported revenue. I estimate OI&E for the March quarter at $175 million dollars, up from $137 million in the December quarter due to the company's rising cash and marketable securities balances that will have reached well over $100 billion by the end of the March quarter. Apple is currently generating cash at a rate greater than $1 billion per week. Based on the factors delineated above, I estimate income before taxes of $16.473 billion. I estimate Apple's provision for income taxes at $4.069 billion based on an effective tax rate of 24.70%. In the December quarter, Apple's provision for income taxes equaled 25.25% of pre-tax income. For the March quarter, I estimate a decline in the tax rate due to a higher percentage of revenue and pre-tax income generated outside the United States. In the prior-year period, Apple's effective tax rate was 24.2%. I estimate Apple's March quarter net income at $12.404 billion. This represents an estimated 28.17% of reported revenue flowing to the net income line. In the December quarter, net income reached 28.2% of reported revenue. In the prior-year period, 24.3% of revenue reached the net income line. Based on estimated net income of $12.404 billion and an estimated fully diluted share count of 943.50 million, my earnings per share estimate for the quarter is $13.15. This represents an estimated year-over year gain of 105.47% and an estimated sequential decline of about 5.20% from the December quarter's $13.87 eps performance. I anticipate the March quarter results will confirm the revenue and earnings growth trends established in Apple's recent December quarter. This is why I have dubbed the March quarter "Apple's Monster Quarter - The Sequel." My March quarter estimates are included in the Braeburn Group AAPL March Quarter Estimate Index. The Braeburn Group is a collection of bloggers and independent AAPL analysts organized under the aforementioned name. There's no charge to become a member of the Braeburn Group, but registration is required at the forum site to view and participate in the lively discussions. I posted the updated Braeburn Group March Quarter consensus numbers on my Seeking Alpha instablog earlier today.